20 Weeks: Junk Drawer No More! Well, it’s my 12th project from my 20 Weeks of Organizing Challenge! Unfortunately I got sidetracked, so I’ve been at it for 19 weeks. Ha! I may or may not catch up (most likely not), but I’ll keep going until I get all my items crossed off anyway. This week, I get to cross off the junk drawers!! I have a confession. There was not one, or even two junk drawers in my house. There were actually THREE! Now this week I wasn’t able to get all three done, but I did tackle the first two and I wanted to share them with you. The first drawer I took care of was the easiest and the smallest. The drawer in the buffet. We like to keep playing cards and dice in there for quick access when guests come over. But it sort of became a catch-all for extra coasters, batteries, phone chargers (for a phone we don’t even have any more? ), and what ever random things that were on the buffet that needed to be stashed before a guest came over. Now it’s back to it’s purpose… cards to play games with guests, matches to light candles when guests come over, and that is pretty much it. There are two plug covers in there because this drawer sits right under an outlet that we use to charge the batteries for the camera. That charger is about the size of a deck of cards and does not have a cord, so I deemed it worthy to get use of the drawer too. 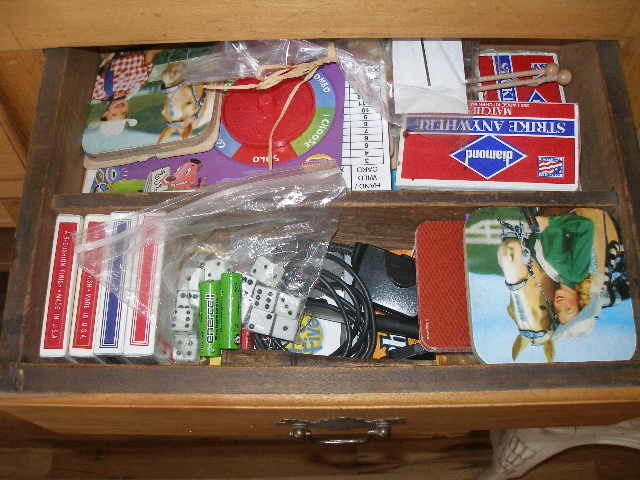 The second junk drawer in the house was in the desk. 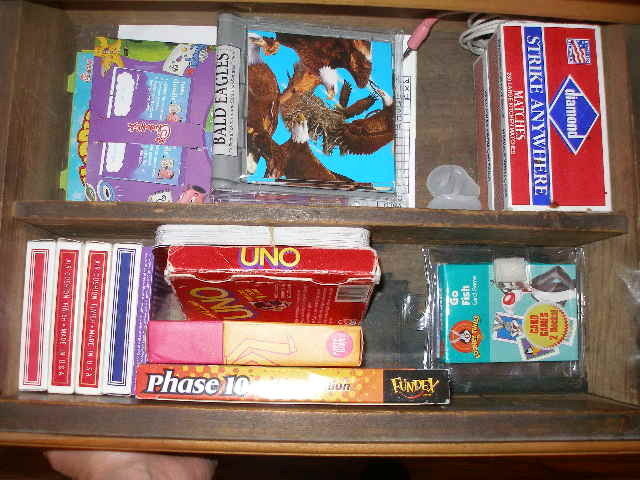 The big center drawer. 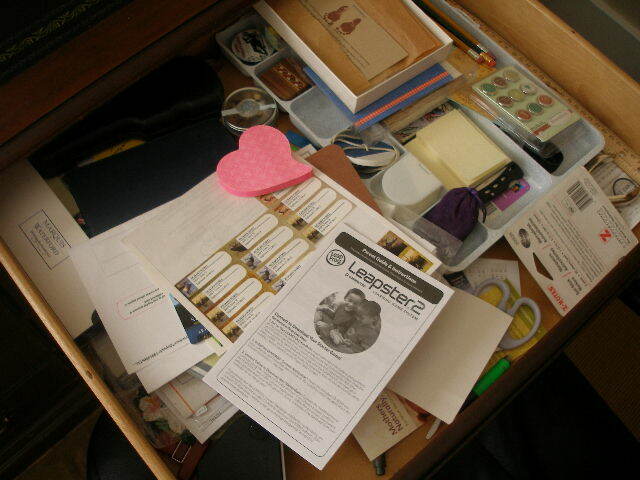 This is an especially problematic area for me, because the drawer is so big and wide that I have a tendency to just clear off the desk into this drawer in a pinch, so when people come they won’t see the mess on my desk. Are you noticing a trend here – I’m a stasher… I hide my messes instead of finding places to keep things. To get this mess in order, I emptied the drawer. There was a lot to recycle, and a lot that didn’t belong in there in the first place. I put those things in their rightful homes. After the cleaning out, there really wasn’t much left to put back in the drawer. I added a paper file thingy, since our desk is out in the open now and we often have paperwork that needs addressing, but also kept away from the kiddos or put away until we can get to it. 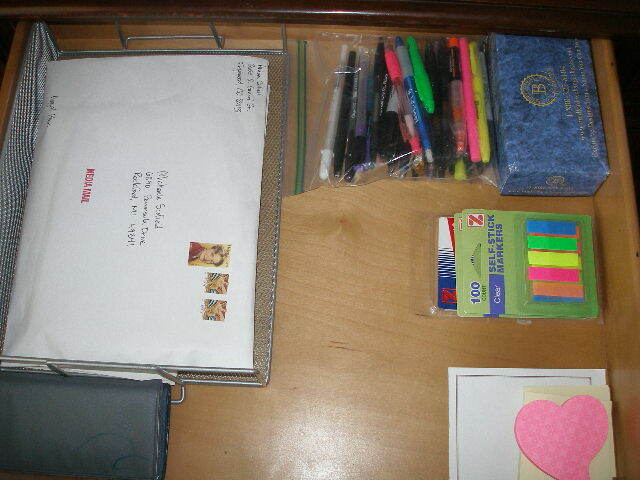 There are spare pens in a ziplock and some sticky notes, and our box of checks. That’s it. I’d like a drawer organizer for this space, but until them, this will do. Next week, I plan to get that third drawer done too. In the mean time, here are my other 20 Weeks projects. If you really like organizing or need some more inspiration, check out the Organizing Junkie. Wow! Still too overwhelmed by my junk drawer to get at it… maybe Sam will? I have a couple of “junk” drawers in my kitchen. Admittedly there are things in there that don’t belong…throw in while cleaning off the kitchen counter or something. For the most part though I do know what is in them and it’s not junk……I wonder how they ever got that name? I guess just because they are the drawers we just randomly throw things in to? I am a “stasher” too! That’s a great idea to keep the playing cards in the dining room so they’re close to where you use them!